Giant Mosiac for Thomas Road Fulbourn. Artist Andy Tanser and best selling author Anna Nielsen have created a giant multicoloured stone mosiac for the play area at Thomas road. Local families attending workshops contributed design ideas that illustrate different kinds of journeys in and around Fulbourn. Artist Andrew Tanser, has been appointed to work on the public art element of the regeneration of the Windmill estate. 3) The Fulbourn Life (Granite) Wall – approx. 3m long / 2m high / 0.15m thick – Artwork and text to be grit blasted into the granite surface. 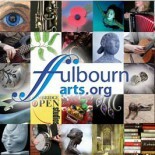 The Fulbourn Life Wall project needs your help. For the The Fulbourn Life Wall we intend to create a Village ‘life wall’ with notable events, people and structures etched into the granite surface for existing and future generations to take an interest and pride in. To make this yours we would really appreciate as much help as possible from you, the residents of the village, with the themes, artwork, text, information and ideas for the granite wall. History, timeline of key events, buildings e.g. windmill, memories, population numbers, maps old to new, natural history e.g. swifts and hare’s, recreation, work / industry, farming e.g. sheep, ploughing, horses, wheat, mice etc., famous people, the old meeting tree, every day objects such as a wine glass, planes, umbrella, car etc. We are hoping to have the finalised artwork ready and approved by mid-July to allow for production and installation by October this year. We really want to capture and have a real sense of the village summarised in the artwork and text on the stone so we need your help, no matter how young or old. Please write your comments to one side of the drawings in the space provided. Or email Andy@andrewtanser.com with ideas, comments, suggestions and drawings. Or post to The Fulbourn Life Wall Project, Accent Nene Ltd Offices, 4 Dunmowe Way, Fulbourn, Cambridge, CB21 5HW.